"Using photography's fundamental ingredients of light and time, Katrien Vermeire allows the medium to make visible what would otherwise be invisible and catches the beauty of a special natural phenomenon. 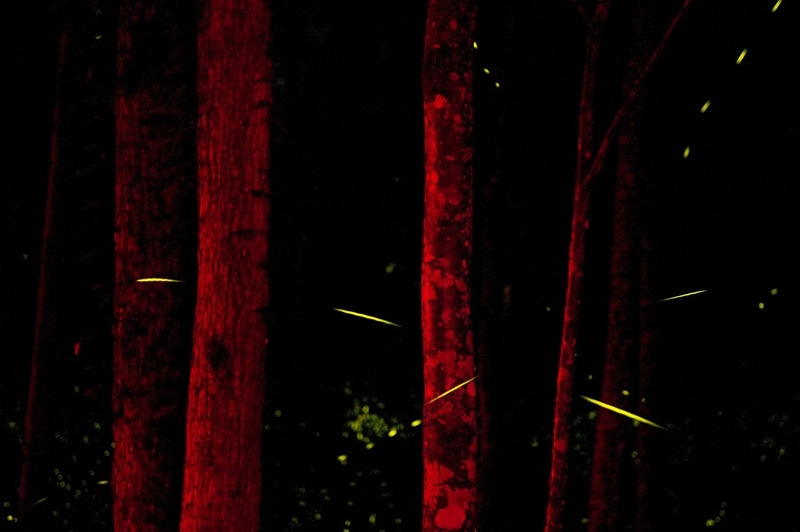 Bright yellow stripes represent the paths taken by fireflies during extended exposure. Katrien worked on her new series Godspeed in Tennessee in June 2010." "In her work, the artist photographer Katrien Vermeire captures the ominous intensity of silence. Just like in this series Godspeed (English for "good luck, safe travels") for which she spent weeks amongst fireflies in the Great Smoky Mountains national park in Tennessee. With long exposure times up to 45 minutes, this blinking natural phenomenon translates in a mishmash of dots and comma's. Or: Jackson Pollock in firefly style."